Three title contenders were in battle today. Manchester United were against Burnley, drawing 0 – 0. Manchester City lost at home to Stoke, 1 -0. Finally Everton hosted Chelsea, which ended in a crazy 3 – 6 win for Chelsea. Manchester United kicked the Saturday off, by drawing 0 – 0 to newly promoted Burnley. Angel Di Maria made his debut for the Red Devils, starting in the midfield, alongside Juan Mata. United had trouble creating chances, and their defense looked shady at best, with especially young Tyler Blackett having problems against a physical strong Burnley strikeforce. Di Maria showed glimpses of brilliance, where he for instance beautifully played a long ball to Van Persie in the penalty box, but Heaton saved his effort. At the end of the match, United felt cheated for a penalty, where Ashley Barnes blocked a shot with his hand in the dying minutes of the match. Chris Foy said no to United’s penalty claims, and the match ended 0 – 0. 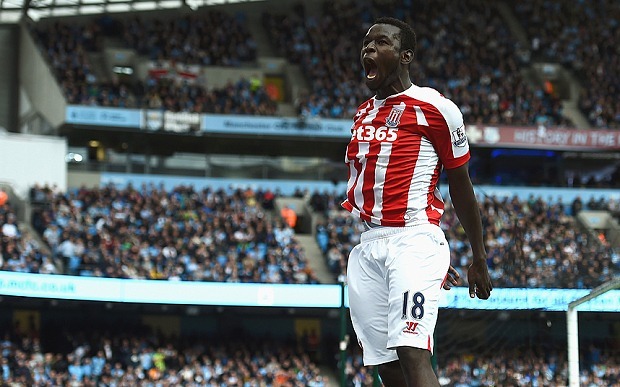 Another shock result was the 0 – 1 win for Stoke against Champions Manchester City. At City’s home ground, no less. A beautiful solo goal from Mame Biram Diouf, where he raced 70 yards towards the City goal, nutmegged two City players along the way and finally slotted it past Joe Hart in-goal. Manchester City also felt cheated for a late penalty, but Lee Mason awarded Yaya Toure with a yellow card for diving instead. No further goals were scored, and the match ended 0 – 1 to Stoke. The final match of the day was between Everton and Chelsea. The match started off with terrific pace, where Chelsea managed to score 2 goals in a couple of minutes, first by Diego Costa, and secondly by Ivanovic. Their second goal looked to be offside, but it stood. Everton goalkeeper Tim Howard was lucky to stay on the pitch, following an event when he picked the ball up outside the penalty box, but it was not seen by the referees. Everton were close to reducing the score to 1 – 2 a few minutes later, when Lukaku hit the crossbar with a header following a corner-kick. Distin scored on the rebound, but was correctly called offside. Everton did manage to reduce the score to 1 – 2, a few minutes before half-time, when Kevin Mirallas perfectly headed the ball past Courtois following a cross from young Coleman. Two goals fell in the beginning stages of the second half, where first Coleman scored an own goal after beautiful play from Eden Hazard making it 1 – 3, and then Steven Naismith almost immediately reducing to 2 – 3 in the 70th minute. This led to some hope for Everton, but this hope was quickly quenched in the 74th minute where a very passive Everton defense saw a Matic shot flew past Tim Howard, making it 2 – 4. Amazingly, Everton reduced again shortly after this, with a goal scored by newcomer and former Chelsea striker Samuel Eto’o! But almost beyond belief, Chelsea once again quickly scored, this time Ramires, making it 3 – 5. Diego Costa removed any doubt of the winner in the dying minutes, after a terrible mistake by Muhammed Besic which saw Mikel and Costa alone with a sole Everton defender and the goalkeeper. Costa rounded the goalkeeper after receiving the ball from Mikel and made it 3 – 6, the end result. The match, an utterly fantastic match, finished off a crazy day in the Barclays Premier League.